January can be a very long month, especially if the weather keeps you indoors listening to your furnace go on and off all night or if storm after storm has shoveling for hours at a time. Music can often soothe the ravaged chest and shoulder muscles - what follows is the beginning of a series of reviews featuring excellent new music. Despite the roiling waves on the CD cover, "From Water" (88 Records) is a series of clarinet solos from the creative mind of Doug Wieselman. Most of the 10 tracks feature looping which often creates a trance-like feel as the musician builds his loops from simple figures. "Train" opens the 10 track program (all originals save for a lovely reading of John Lennon's "Julia") - the music rises and falls on a short 4-note rhythmic figure which moves in and out of the foreground while Wieselman's melody lines float like train whistles on a frontier night. "Pacific 2", inspired by standing down by the shore, has a circular melody similar to ones created by soprano saxophonist John Surman on his solo recordings. "Salmon"builds off of longer tones, with silences that allows the melody to stand out. Halfway through the track, the looping begins and the piece becomes a lovely prayer with echoes of South African music. As for the Lennon tune, the performance rises from the short chorus into the melody, the longing from the original vocal version evident in the handsome tones of Wieselman's vintage clarinet. "Gloria Fleur Madre" is a composition for solo clarinet (no apparent overdubbing) that reminds this listener of the solo work of the late John Carter, with a melody that straddles blues and atonality. Meanwhile, "Tennessee Valley 2" features a choir of voices performing the melody lines of an earlier instrumental version ("Tennessee Valley") of looped clarinet and vocal percussion. "From Water" is haunting, challenging, meditative music that resonates long after the final notes fade. Doug Wieselman, who works with Antony & The Johnsons, co-leads Trio S and Kamikaze Ground Crew and has performed/recorded with Bill Frisell, Marty Ehrlich, Laurie Anderson and so many others, has given listeners quite a musical gift, the joy of losing one's self in a swirl of melodies. For more information, go to www.dougwieselman.com. There are a slew of fine pianists working today, many of whom listeners often take for granted. I'm thinking about mature players such as the late Mulgrew Miller, Ahmad Jamal, Kenny Barron, Harold Mabern, Fred Hersch and, most certainly George Cables who played brilliantly as leaders and sideman. Their solos often have echoes of those who preceded them but are all their own. Mr. Cables, the 69-year old native of New York City, has been a busy musician since the 1960s when he graced the groups of Max Roach and Art Blakey. Moving to the West Coast in the early '70s, he worked with Joe Henderson, Sonny Rollins, Bobby Hutcherson, Woody Shaw, Dexter Gordon and, most important, alto saxophonist Art Pepper. Due to his versatility, he has never lacked for work or recording contracts - for the past 5 years, he has toured and recorded with trumpeter David Weiss's The Cookers. "Icons & Influences" (HighNote Records) is his new CD and features Victor Lewis (drums) and Hartford, CT, native Dezron Douglas (bass). Opening with the 3 originals in the program of 12 tracks, Cables pays tribute to Cedar Walton using the late pianist's name as the title of the sprightly cut while "Farewell Mulgrew" is soaked in blues and gospel lines in the first few minutes before the music picks up a serious head of steam. The pianist's long solo builds off the forceful interactions with his rhythm section. The final Cables original is a sweet, up-tempo, jaunt appropriately titled "Happiness." The remaining 9 tracks range from recognizable standards such as "Come Sunday", hear heard as a duo for piano and bass, and "Nature Boy", the trio's version influenced by the John Coltrane Quartet version from 1965. There are several pleasing surprises such as the sweet ballad reading of Bill Evans' "Very Early" and the solo piano rendition of Benny Golson's "Blue Heart" that closes the CD. Perhaps the most pleasant of the surprises is the fun reading of "Mo' Pan" - composed by the legendary Calypso star Aldwyn Roberts (1922-2000), who is better known as "Lord Kitchener", the track is propelled by Lewis's exciting drumming, Douglas's solid dancing bass lines and Cables' 2-fisted recreation of steel drums. Joy and sorrow intermingle on "Icons & Influences", with the former getting the upper hand. While George Cables understands the role of loss in one's life as a person and a creative artist, he also understands the power of music to heal. This recording illustrates how Mr. Cables is still growing, still playing at the top of his creative powers and just how good a piano trio can be. For more information, go to georgecables.com. 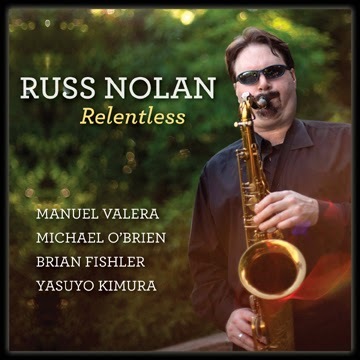 Saxophonist Russ Nolan (tenor and soprano) has a new CD - "Relentless" (Rhinoceruss Music) is his 4th recording as a leader and continues his fusion of Latin rhythms with strong melodic lines. The rhythm section (bassist Michael O'Brien and drummer Brian Fishler) from his previous CD, 2012's "Tell Me", is back, giving the leader plenty of support and forceful nudging. Manning the keyboard chair is Cuban-born Manuel Valera, a pianist with great rhythmic feel who also understands when to light a fire under the music. Percussionist Yasuyo Kimura, a long-time member of Los Mas Valientes, adds even more punch on the 3 tracks she plays on. This music jumps for the opening seconds of the title track to the climactic close of the final cut "Abakua." With the exception of a thoughtful re-arrangement of Duke Ellington's "Solitude", this music crackles with excitement. Valera and Nolan fly over the rhythm section on that title track, taking flight as the bass and drums drive with great intensity (admirably without bombast.) The blend of blues chords, splendid brush work and a sensual rhythm gives Nolan's tenor strong support on "Not While I'm Around", a Stephen Sondheim composition from "Sweeney Todd." Pay close attention to Fishler's excellent bass drum work during both Nolan's and Valera's expansive solos. Valera adds Fender Rhodes to several tracks, including "Mr. Moore" where he utilizes for colors behind his hearty acoustic piano chords. "Limbo" (not a reference to the dance or the video game) has the feel of a work by Wayne Shorter in its expansive piano chords and the soaring soprano sax solo. Valera picks up on the leader's intensity to create a solo that starts over a martial rhythm and escalates from there into a splendid statement. If the music on "Relentless" warm you up, even make you want to dance (Russ Nolan is a accomplished Salsa dancer), then there may be little hope. The sensuality and forward motion of songs such as "Cassa Cerado" played at high volume can just lift you out of your chair (be careful listening in the car - there are many moments when this music seems to make the automobile go faster.) The musicianship is impeccable, the songs smartly composed and the rhythms irresistible - grab ahold and don't let go! For more information, go to www.russnolan.com.